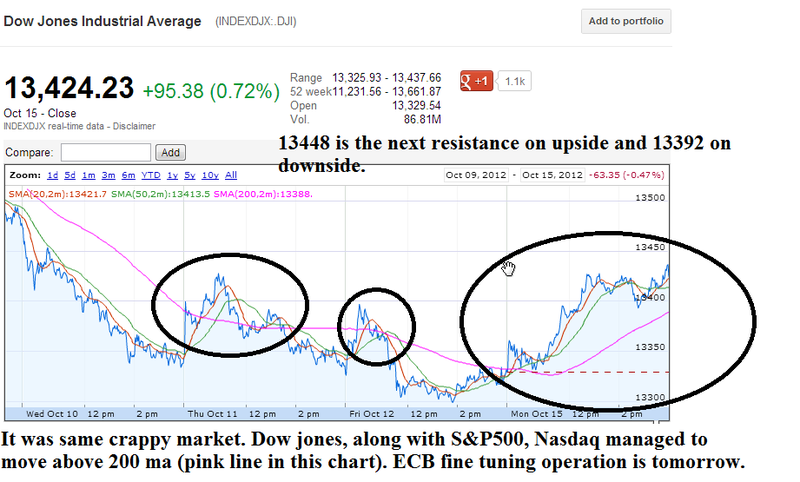 ECB is carrying fine tuning operation tomorrow and If Dow manages to break 13448, then it reverses the downtrend to uptrend and Price target will be 13492. 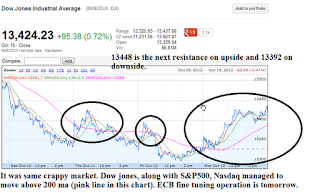 On the other hand 13392 is key breakpoint on the downside which will make sure it the downtrend continues. Same way 1439 is key resistance in S&P500 on the upside and 1429 on the downside. Dow Jones moved above 200 ma once again. Breaking 13448 on upside will be bullish sign and PT is 13492 while on downside 13392 is key breakpoint. 9 p.m.: President Obama and former Massachusetts Gov. Romney meet in the second presidential debate, at Hofstra University in Hempstead, N.Y.